While thinking about what to do in Stockholm besides seeing my son, his cohabitant, and her parents, I saw there was a weaving exhibition at Nordiska museet. As the world around me seems to be working to get me weaving after a pause lasting about two decades, I thought it would be in line to get me and hubby to see that exhibition. It was worth it. More to come about that later. 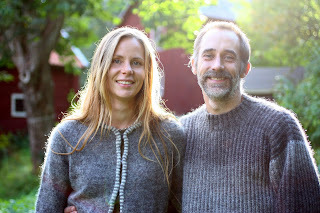 This is one of Solkustens Spinnverkstad's singles yarns in natural sheep colors. They spin several colorways of this yarn, and also as a 2-ply. It's soft, evenly spun from high quality Swedish sheep wool, and prepared and spun with gentle handling. 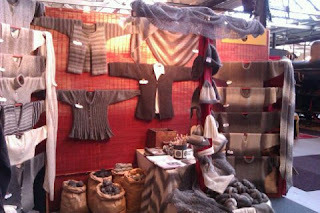 This is highly skilled handicraft, worked with a respect for the wool you would like to see more of. It's a small mill, and even if their site is only in Swedish I'm sure you can contact them in English. You can do this with any long needle with a blunt tip. Just cut some slits in the short ends, string a few warp threads, and start weaving. This is a wonderful way to teach children the first mysteries of weaving. See the Scandinavian light in that beautiful photo? Not to mention the awesome garments! I love the natural sheep colors. It's reassuring to see wool being used in this way. High class quality in craftmanship, products and design are essential for the small spinning mills. Solkusten have it all.